Habitat: It grows in flattened rocky terrains amongst agricultural land. It is seriously endangered in its native habitat as much of the land is cultivated for arable crops or grazing pasture. Parodia werneri f. inermis hort. 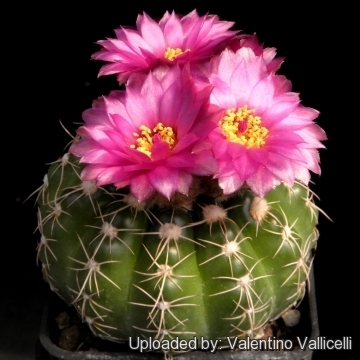 Notocactus uebelmannianus f. inermis hort. Parodia werneri f. variegata hort. Notocactus uebelmannianus f. variegatus hort. 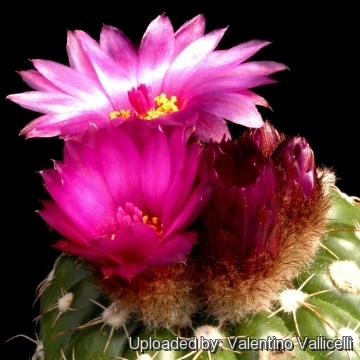 Description: Parodia werneri is a a nice cactus usually solitary, sometimes branching basally to form small clumps. It has glossy green body with appressed spines and bears a ring of the most amazing magenta to royal purple flowers every spring. 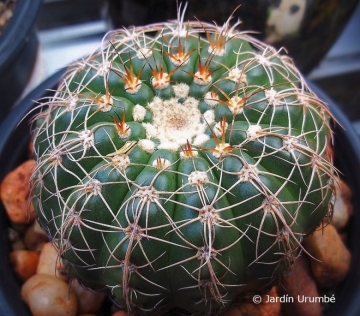 Replaced synonym: Notocactus uebelmannianus Buining, Kakt. and. Sukk. 19(9): 175-176 (1968), non Parodia uebelrnannlana Ritter, Kakt. Siidamer. 2: 425-426 (1980). On transfer to Parodia since a Parodia uebelmanniana already existed the name of uebelmannianus was changed to Parodia werneri, hence the name Parodia werneri is the current accepted Scientific name but many growers and plant sellers still use the old name Notocactus uebelmannianus, so you may come across it under both names. Stem: Shiny dark green, globular or short/squatty up to 12 cm tall and 17 cm in diameter. Ribs: 12-16, flat, round, more ore less chinlike. Areoles: Round, large, dull white or creamy white-felted, each with a shallow groove below. Radial spines: About 6 spider-like, 10 to 30 mm long, appressed against the stem body, one pointing downward, unequal, white to greyish. 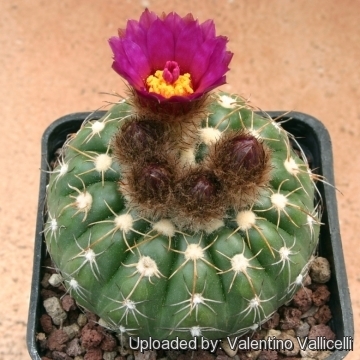 Flower: Small about 5 cm in diameter, short funnel-form, shiny, wine red to deep magenta of various tones, or pure yellow (Parodia werneri f. flaviflora). 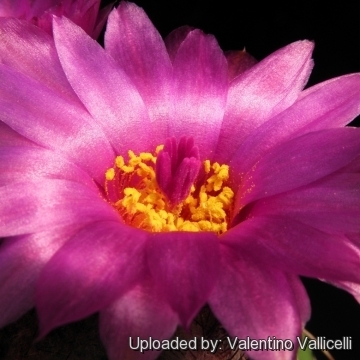 Both purple and yellow flower colours can exist side by side in some populations and the yellow being the most abundant. Therefore the more commercial but less representative purple flowered form was made the species and the more typical yellow flowered the variety. Blooming season: Spring to early summer, once it reaches about 7 cm in diameter if kept well it will flower every year. Parodia arachnitis (F.Ritter): has spidery spines and bright yellow blooms. Distribution: Rio Grande Do Sul. Parodia werneri f. inermis hort. : spineless form. Garden origin (Nursery produced). 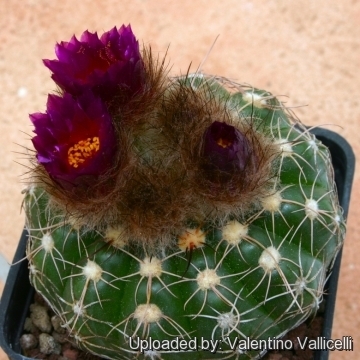 Parodia werneri subs. pleiocephala (N.Gerloff & Königs) Hofacker: tends to grow in clusters. Parodia werneri f. variegata hort. : Variegated form. Garden origin (Nursery produced). 1) David R. Hunt “Cactaceae Systematics Initiatives: Bulletin of the International Cactaceae” Systematics Group. 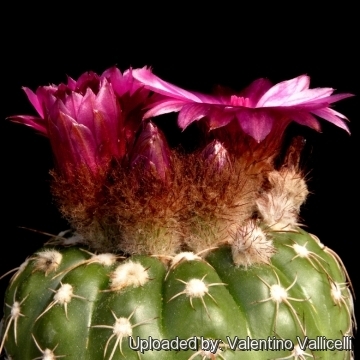 Cultivation and Propagation: Parodia werneri (syn: Notocactus uebelmannianus) is easy to grow and quite resistant to neglect. Nevertheless, it is appropriate to provide adequate growing conditions in order to obtain abundant blooms. 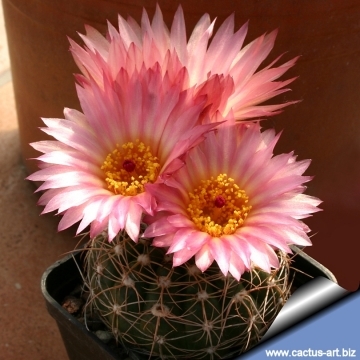 Soils: It needs a standard cactus mix soil with an excellent drainage. Prefer a low pH compost, avoid substrata too rich in limestone. 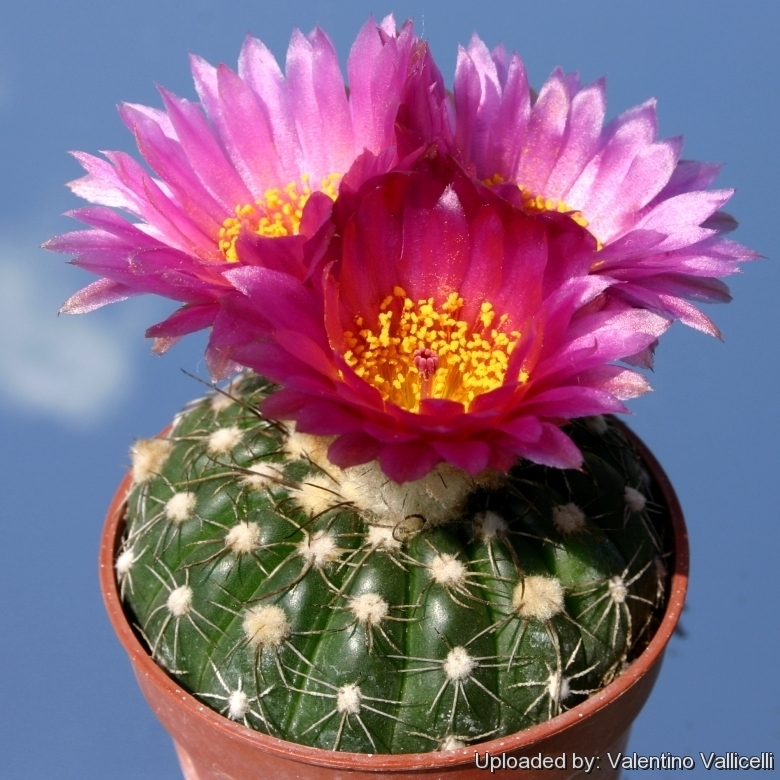 Watering: Needs regular water in spring to autumn in summer (it is more demanding than other cactus), but do not overwater, keep dry in winter or give them a very small amount about once a month in winter to prevent shrinkage and root loss. Hardiness: It is moderately frost resistant if kept dry and hardy to -4° C for short periods (depending on varieties and growing conditions). However warmth throughout the year will increase the grower's success (at temperatures from 5 to 15 degrees centigrade during rest season).